For a long time I have claimed pastel colours as my one true nail polish love. We all know this. But now? Now there is a new challenger that has forcibly shoved pastels out of that top spot. TEXTURED POLISH YOU GUYS OHMYGOSH. I am actually in love. I know this is already an old thing for most of you, but I have resisted these polishes for so long... I bought OPI's Jinx when it came out but never bothered to use it because "ehhhhh, I don't really get the textured nail polish thing." 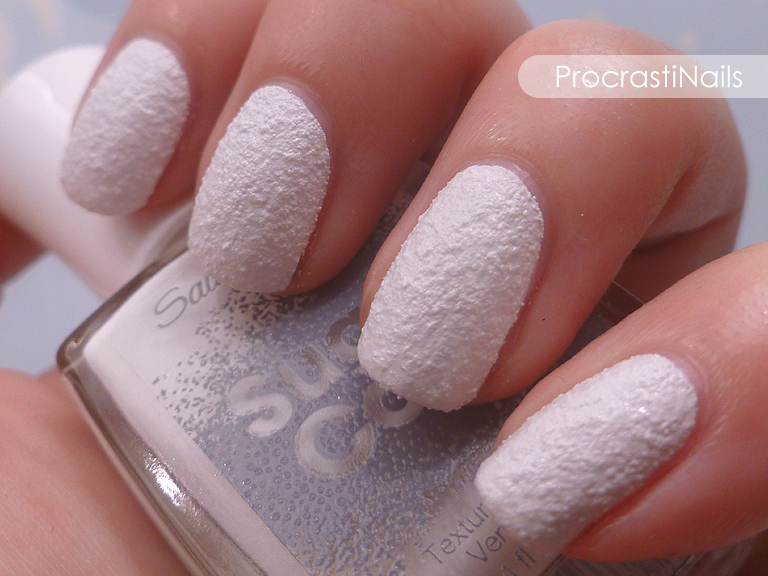 But I came across Sally Hansen's Sugar Coat line at PharmaPlus the other day and grabbed a few to try. And now that I have actually tried them I have seen the light, and it is dangerous to my wallet. It was hard to decide which colours to pick up for my first real try for textured polish. 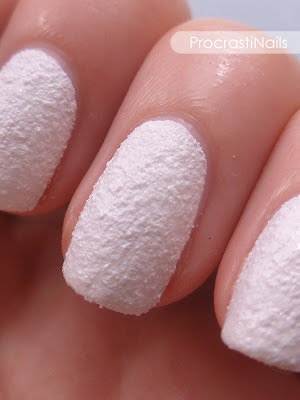 I got the white (called Sugar Fix - cute!) because I thought it would probably be useful as a base in future designs. I was very right with that, as you'll see in an upcoming mani I did for Pride this week. Since this is a white polish I decided to swatch it against a coloured background (aka scrapbook paper). I did the pictures with the standard white too, but they were so boring. This may be the start of a helpful merging of my nail polish problem and my scrapbooking problem! :) These are also all done in artificial light. I did three coats for these pictures, but it was surprisingly good after just two. I loooove the texture, and even though it's fairly rough it wasn't bad enough to actually catch on anything or scratch me. A friend suggested I file the edges of my nail to get the grit off the tips, but I didn't bother this time. That would be a good idea to make it look tidier, though. And that's it! So what about you. 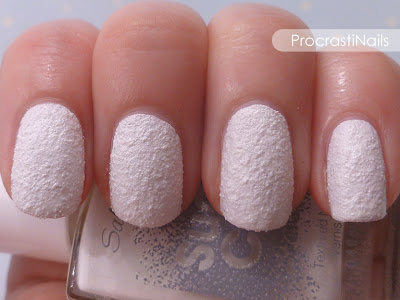 Textured polish: love it or hate it? Thanks! I'm a fan, it'll make a great base! I like the white. But for some reason, I keep thinking of things to do with it in a Christmas/Winter mani. It could make for some fun textured holiday manis I bet. Ouuuu I agree! It would make some cute snowmen or the fuzz on a Santa hat!